I have had a stack of product reviews growing in the background during the past few months. There’s been a lot going on and my head is in a million different places, but I’m trying to pick back up with things. The products I’m reviewing today are bright & happy. They certainly put a smile on my face, and I only had to read so far as the collection name, Equestrian Prep, to know that I wanted to review them! 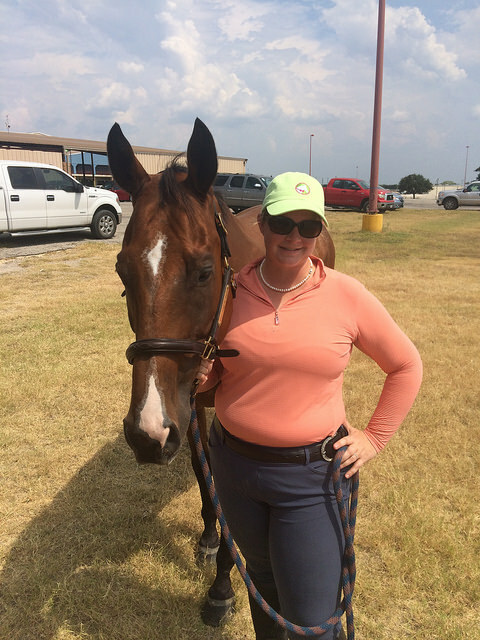 In my normal life I pretty much wear pearls, boat shoes and polo shirts the vast majority of the time… so equestrian prep is right up my alley. 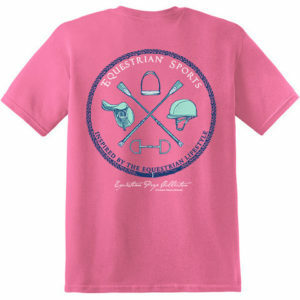 With colors ranging from soft pastels to muted neons, Equestrian Prep targets the southeast feel of brands like Vineyard Vines and Southern Tide with an equestrian flair. The company logo is a horse wearing a bow tie – as all proper preppy horses should! I received a t-shirt, hat and koozie from Equestrian Prep. The shirt I picked out is the Equestrian Sports Short Sleeve, and although I tried to get a decent picture of myself wearing this shirt the dogs haven’t learned to take photos yet… so I’ll have to figure out other ways to get creative on that problem. Anyway, I’m not a huge pink person but this pink is a very acceptable color to me. It has almost a muted tone to it, so it doesn’t scream I’M WEARING A NEON PINK SHIRT YAY ME! The front pocket detail is my favorite, featuring the Equestrian Prep bow tie horse logo. On the back, there is a large equestrian design in a theme popular to a lot of logos/brands lately. A cross hair in a circle basically, but with equestrian motifs. The fabric of this shirt is thick and soft, so I think it will hold up for a long time. The stitching is on the chunky side, but in a cute way. I will say that the sizing is very generous. I ordered the size I typically wear in women’s t-shirts, and the shirt is very big on me. It’s definitely more of a unisex sizing model, and if you’re in doubt I suggest that you size down. While I like the Equestrian Prep shirt, I love the hat. 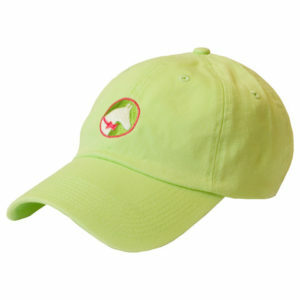 Lime green is one of my favorite colors, and the embroidery on this hat is super cute. I got several comments on it when I wore it at the Summer Circuit show a few weeks ago. I really like the construction and shape of this hat. It’s cute. It fits. 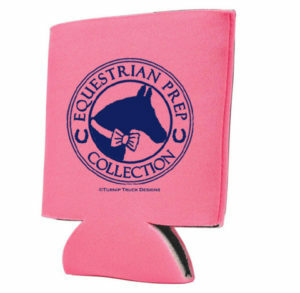 It’s preppy and equestrian! While I know that not everyone is fully into the preppy style, I’m sure at least a few of you are! For those that think they would enjoy these clothes, I am happy to feature a giveaway today sponsored by Equestrian Prep. They are sponsoring an Equine Sports Short Sleeve Shirt in a size Small. To enter, just leave a comment on this blog post telling me what your favorite design or product from Equestrian Prep is and make sure to fill out your answer in the Raffle Copter widget below! I will choose the winner a week from today, on Friday August 21st. Good luck! I love the coozies! Can totally see myself muggin the Barn Girl version. I didn’t know about this company before- thanks for reviewing! I want a hat now! Gonna have to check out their stuff and pricing. I have this shirt in the long sleeve version- we need to get together and get our #twinning on! I absolutely love that hat, too! I want all the long sleeved tees! The pink english sports one would probably be my fav. Small is just my size 😉 Love the koozie too! That hat needs to be mine. Seriously. I love it. Love the cute horse with the bowtie!! I like their look! I can’t use a small, but I’m sure I know someone who can. So cute! I love the “Preppin’ for Show Day” design. Love the horses wearing bow ties! so cute! I LOVE the long sleeved shirts, especially the lime green! Horse in a bow tie? Obviously the most dapper thing ever. 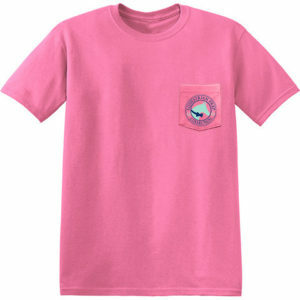 I’m a fan of the pink tshirt ! Eeee I love the prep my ride shirt! So cute! I love the Lime Green Prep my ride T-Shirt! I like the pink preppy bowtie horse hat!! Love the darker blue with the sunglasses-wearing pony. 🙂 But all of the designs are great! I really like the show days short sleeve shirt! Probably the hat – but the logo on the shirt is great! I love pink but I’d have to go with the red/white and blue. Cute shirt, but I love that lime green hat! The lime green long sleeve with the horse wearing pink is definitely my favorite! No wait… maybe the blue with the horse wearing sunnies…. It’s TOO HARD TO CHOOSE! I am a baseball cap hoarder so naturally I now need one of those I my life. Haha. And you can never have too many t-shirts. Oh man. The Prep My Ride t-shirt. It’s officially on my Christmas/Birthday gift to me list! I have never heard of Equestrian Prep – very cute!